I took some photos about akoya pearl farms in 2006 year. I took one photo at the shore. The remote is akoya pearl farm. Because of seawater pollution, the oysters must be cultured in the deep sea. 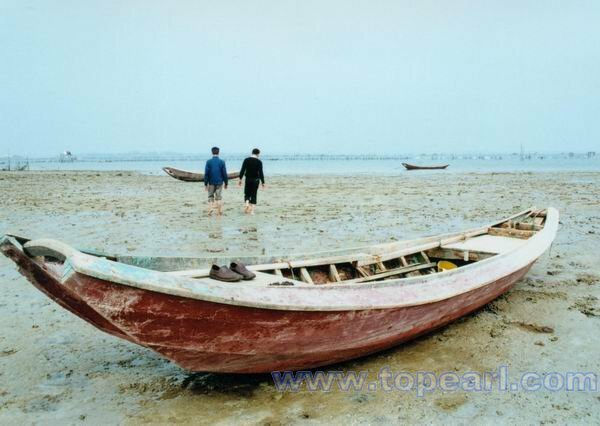 Because the tide fell, we had to took off our shoes, stepped to the small boat at the sea so that we can visit the pearl farm by boat. We finally got to the akoya pearl farm at the deep sea. The seawater is blue,no polluted to guarantee the quality of cultured pearls. 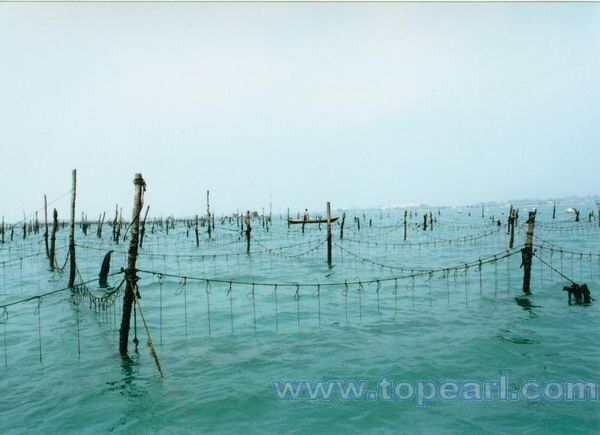 the bulk akoya oysters in the cages are hung beneath the sea water. Saltwater oysters are generally nucleated using a "bead" prepared from mother-of-pearl. 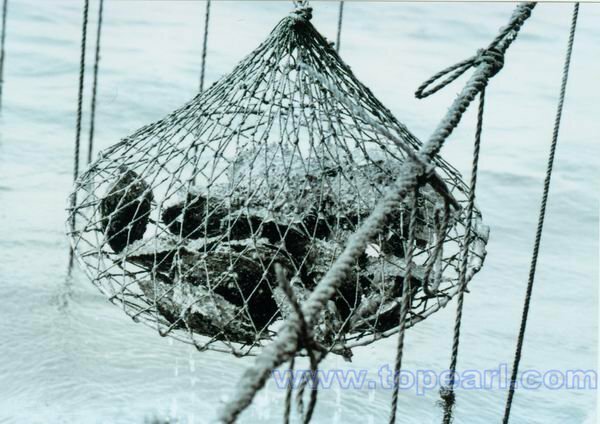 Then they are placed in cages and moved into the oyster beds. The pearls in oysters are gradually developing. The pearl is the oldest gem—often referred to as the “queen of gems” is become more popular in human life not just for their charming luster and different color ,also the cultures &history of the pearls always attract the pepoles ,also the special usage of the pearl such as Cosmetic & Medicianl Uses are common in the pepole's life. Throughout the age, Human have been enchanted by pearls and the shells of the mollusks that produce them. Almost 6,000 years ago,In Greeks, pearls signified purity and loyalty to the marital bed. The Greek god Hymen, the god of marriage, is often depicted holding a strand of pearls, representing the marital bond between Eros (heart) and Psyche (mind). During the Roman Empire at the time of Julius Cesar the first “pearl craze” occurred . Their value was so high that just one pearl could fund an entire war! During the Renaissance the second “pearl craze” occurred . Spanish royalty became wealthy from pearls found in the Americas by explorers. During the Middle Ages, pearls often wore by gallant cavalier onto the battle field for protection. In feudal Japan, physicians treated their noble clients with pearl ointments and tablets. Pearls were also prescribed in potions for longevity and love. In Persia, pearls were used to cure indigestion, hemorrhaging, and malaria. In many Asian countries like china, pearls powders and pearls pills as well as pearls creams and pearls ointments are often use to treat toxicity and diseases of the eye and ear in china. For centuries,people have relied on “pearl powder” made from ground up shells and low-grade pearls to give their skin that pale, pearlescent glow. A Pearl Necklace You Could Fly Away With! rdinarily, I try to refrain from personal commentary, views and opinions when showcasing a piece of jewelry (certainly when it is not one of our own manufacture..;-). I simply show the piece and leave it to you faithful readers to make your own judgements. This time, I simply cannot help myself! What in the world was this jewelry designer thinking when he/she created this pearl necklace, called "Splendid Night" for a recent exhibit of pearl jewelry in Jinan City, China!!! I mean, it almost looks like a set of wings!! Perfect for a peacock, not a woman, IMO. Now that Nancy Pelosi has become Speaker of House, she is being graded not just on her politics but also on her fashion. The Washington Post noted that, when she made her debut, "Pelosi had to decide how a woman who will be second in line of sucsession to the presidency should look". Pelosi responded to the challenge with a power suit accessorized with a beautiful strand of multi color pearls (hopefully they were real :)...). I guess pearl jewelry isn't just in style, it has now entered the political arena as well! The Famous Necklace sold at New York—Christie's auction house for $7,096,000. 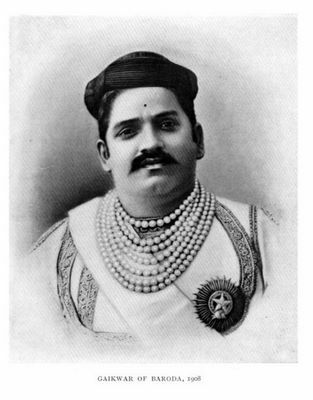 has received a record price for the Baroda Pearls. Information on species and countries where natural pearls are found. Australia Where are pearls found? Canada Where are pearls found? French Polynesia Where are pearls found? Indonesia Where are pearls found? Mexico Where are pearls found? Philippines Where are pearls found? Christies to Auction Elizabeth Taylor Jewelry. Christie's Magnificent Jewels auction on April 25 will feature three couture pieces from House of Taylor's Elizabeth Collection, inspired by actress Elizabeth Taylor. The first piece is a diamond-encrusted necklace with 12 golden pearls mounted in 18-karat white gold, estimated at $200,000 to $300,000. This diamond and pearl necklace and earrings set from House of Taylor's Elizabeth Collection will be auctioned at Christie's Magnificent Jewels sale on April 25. The second piece is a pair of diamond-encrusted earrings with four large golden pearls set in 18-karat gold, estimated at $6,000 to $8,000. The third piece is a double-strand ruby-and-diamond necklace with a tassel featuring cushion- and oval-cut rubies with round- and marquis-cut diamond floral accents in 18-karat gold, estimated at $180,000 to $250,000. All pieces display a stamp that reads "Elizabeth." 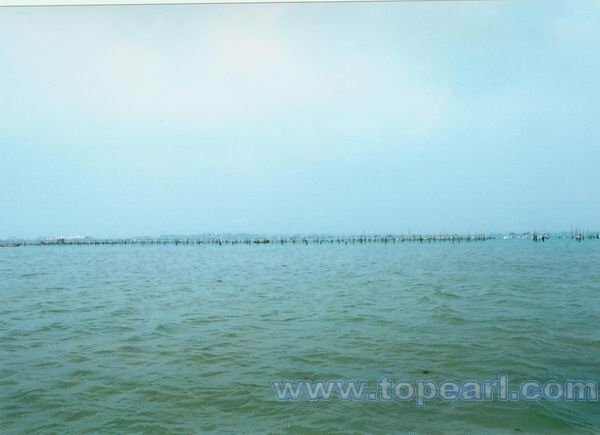 As a professional Pearl wholesaler , we have our owned pearl farm in Zhangjiang (Liusha Gang or Liusha Town), a major Akoya pearl farming region in China.These are some photo may be attract you of our pearl. On the way to our pearl farm from my home village,the first shock of feeling by the lying castled bank. Just take a overlook of our farm ,you will have a first mind of where our pearls come from. Seeing the floating pearl farms are located in fairly proximity to one another. Do you want to get closely to the oysters yourself. Oh,you can carefully inspects Nets full of oysters now. Most of gem and jewelry lovers want to wear a pearl jewelry that suit for him,of course the pearl earring and pearl necklace is not a bad choosing. Some pearl earring often wrapped on two rows of golden chain or Sterling Silver Chain,if you are a birdesmaid want to feel noblest,this can fit you. 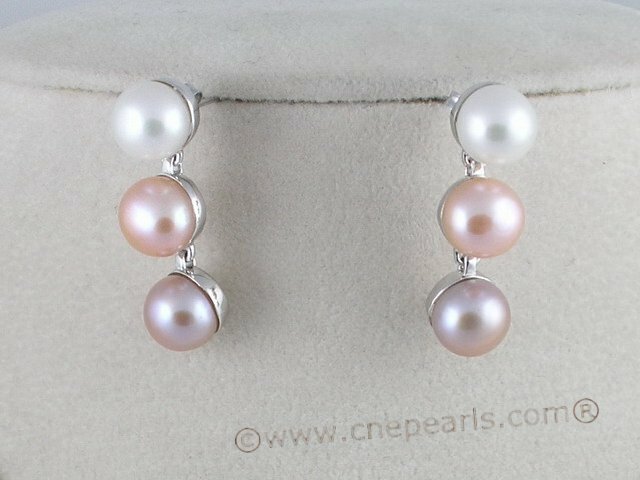 If you want to catch the eye of every person in every situation ,a pair of 15mm drop South Sea pearl earrings or a 8.5-9mm multi-color bread pearl earring feels good. 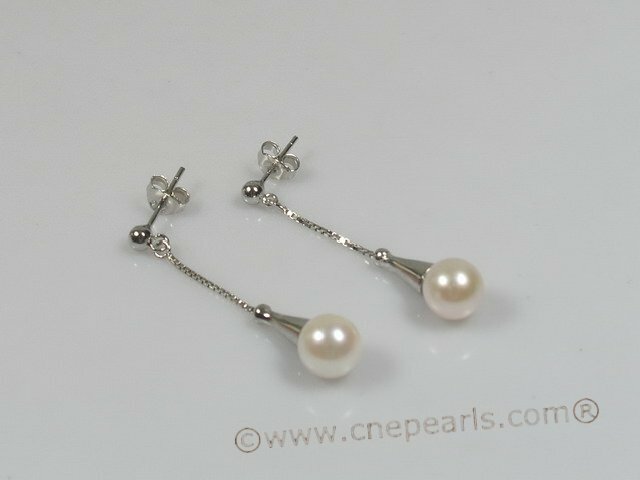 If you do not like the heavy earring ,thus has 7-8mm pearl stud would be perfect. 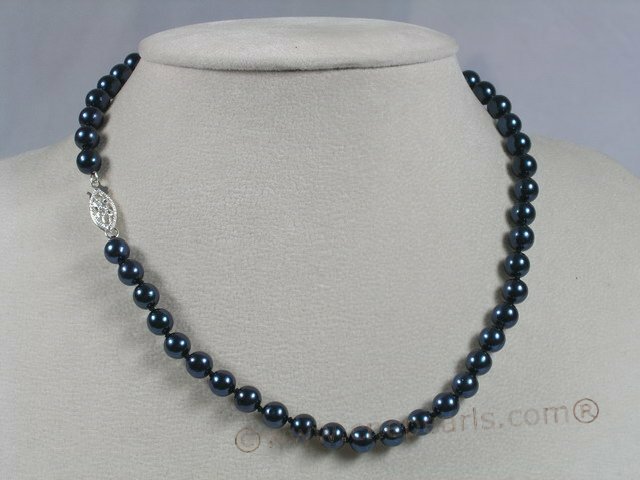 About the pearl strund , There are five well-known and accepted lengths for pearl necklaces . Choker is usually 14 to 16 inches in length, lying just below the hollow of the neck,often wears in a special occassion,such as wedding. 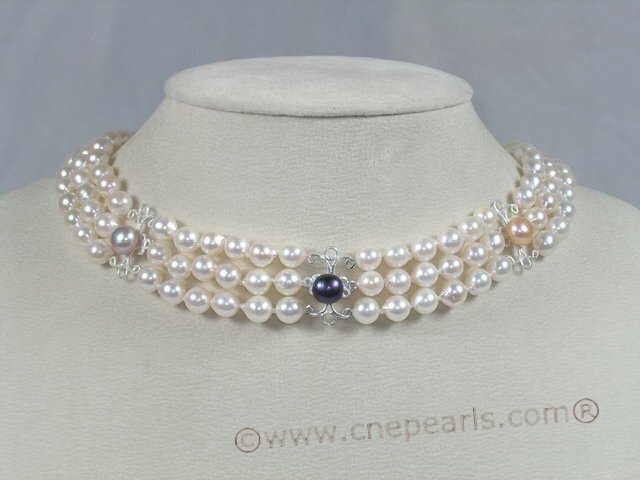 The pearl necklace 16 to 20 inchs in length called “princess” is suit for the young fashion lady.it can make the young lady more charming and vigorous. To a mature lady ,The “matinee” is 20 to 26 inches long may be good.undefinity it is a noblest and glamorous apparel. The “opera” length is about 28 to 32 inches and The “rope” is anything longer than opera length,it is a good choosing , when you want to draw everyone's attention on you . 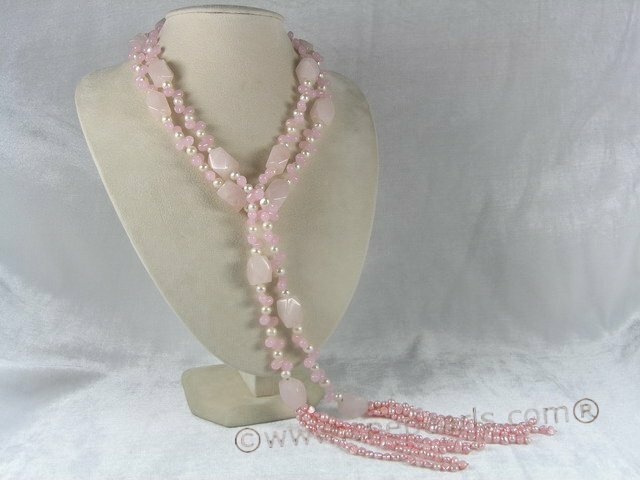 This page contains all entries posted to wholesale jewelry,pearl jewelry,cultured pearls in July 2007. They are listed from oldest to newest.